My Baggage is the No.1 student shipping company, delivering luggage to almost 30,000 students worldwide. If you need to send a suitcase to university, we can delivery it quickly, conveniently and at a student-friendly low cost. When packing for university, many students will inevitably find that they need to bring a lot more belongings with them than they initially thought. As a result, your move to university can prove to be very difficult, especially if all of your possessions simply won’t fit into one suitcase. It’s even worse when you have to take into consideration travelling by boat or plane – especially with how expensive airline baggage can be when taking multiple suitcases. Low cost student suitcase shipping. Door to door suitcase collection and delivery. My Baggage provides an extremely welcome solution to the worries of transporting your suitcases to and from university. We offer super fast, reliable and stress-free student shipping at an affordable price. With us, you can send as many of your suitcases off to university as you like and each can weigh up to 30kg – definitely much more generous and convenient than what which is offered by airlines. You can have your suitcases delivered within 1-2 days within the UK or 2-3 days internationally. We also offer an Express service for both domestic and international shipping – so you don’t have to be without your belongings for long. We work around what suits you – meaning you can choose your collection date. And to make sure you’re always in the know, you’ll have access to full online tracking alongside SMS and email notifications. We have a dedicated customer service team on hand to answer any queries you may have through phone, live chat or email. It’s so important to us that everything is as easy and as stress-free as possible for you to send your suitcases to university. 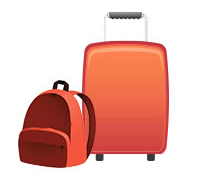 If you’re studying abroad or if you are an international student, My Baggage can help. We offer fantastic low rates and fast delivery times for suitcases sent overseas. 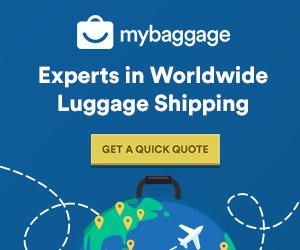 We send luggage to over 200 countries worldwide. You can get a quote from us anytime.